I posted a picture of an apricot cobbler I made a while ago on the PP’s Instagram page, however have been rather slack in getting round to posting the actual recipe but, drum roll please, here it is at last! Sadly in the space of time it’s taken me to get round to this, apricot supplies in Singapore seem to have dried up, which is such a shame as they are such a delicious fruit when in season. 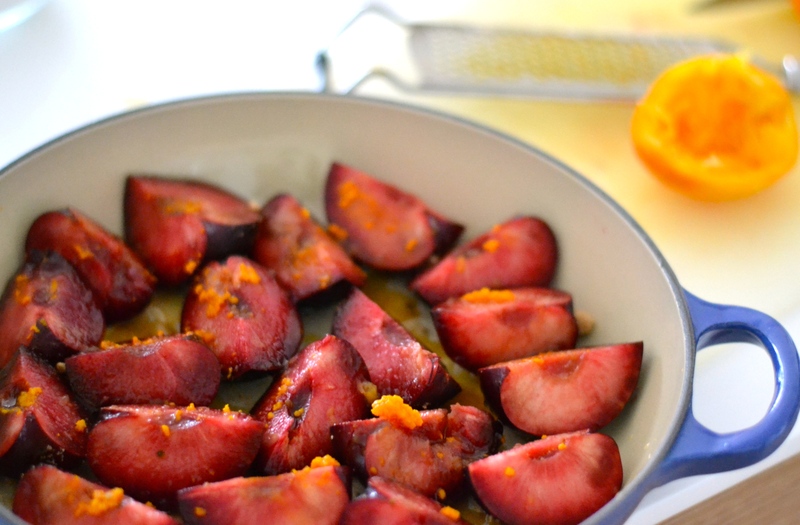 But fear not, this is an easily adaptable recipe and can be made with all sorts of fruit from peaches and apricots, to apples and blackberries, and of course, my trusty friend of late, the plum (apologies for the plum overload…)! 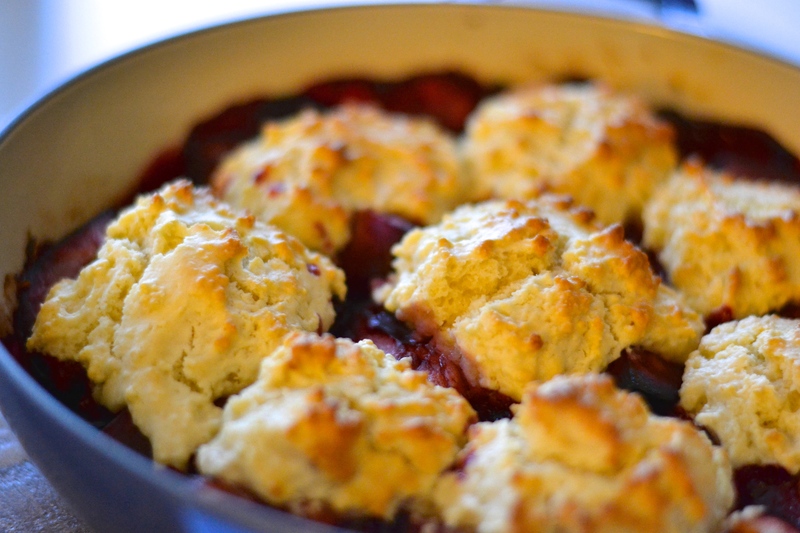 There’s something about a cobbler that seems a little more exciting that a crumble. Perhaps that’s just because, for me, crumbles have their roots in school lunches and the ending to a blow out Sunday roast, whilst cobblers hail all the way from the far off and therefore infinitely more exotic American South. Presenting guests with a plum/peach/apricot cobbler coupled with a scoop of vanilla ice cream just appeals so much more to me as a result. 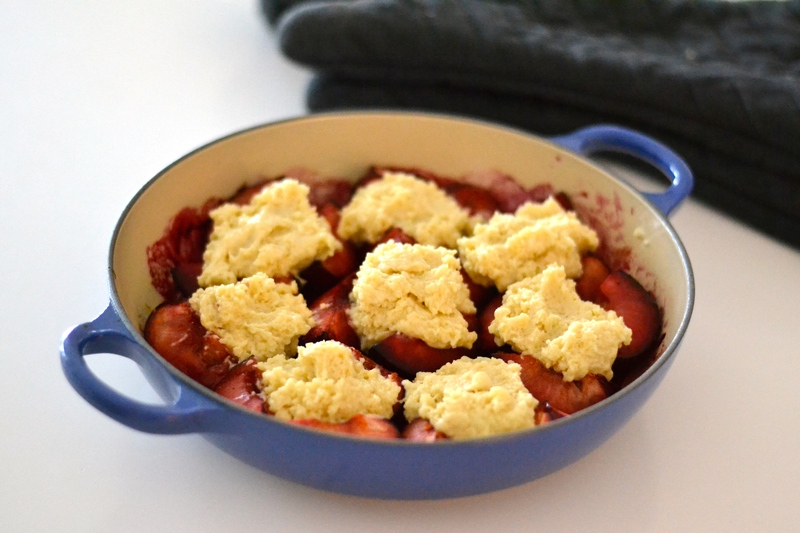 Like their cousin the crumble, cobblers are seriously easy to throw together and bring out the best from your seasonal haul of fruit. They are also perfect for those stone fruits that haven’t quite ripened as you hoped they would. You can roast them off in the oven before topping with the cobbler mix to ensure everything ends up juicy and unctuous upon serving. In the recipe below I’ve added some ground almonds to the cobbler batter and a grating of orange zest and squeeze of orange juice to the roasted plums for an extra yummy twist on a plain old plum cobbler, however feel free to leave out these additions and go for a classic bake instead, or perhaps add a bit of cinnamon or ginger if you’re feeling adventurous. Pre-heat your oven to 190ºc/170ºc fan/375ºf. 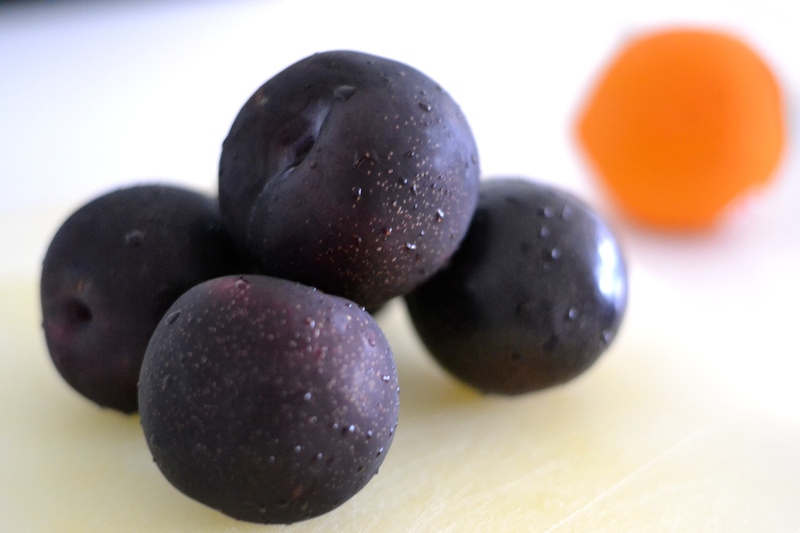 In an oven-proof dish about 20-25cm in diameter, place all of the ingredients for your plums and mix together gently. Bake in the oven for 10-15 minutes until the plums have softened slightly (the riper they are, the less time they’ll need). Whilst the plums are baking, place the flour, almonds and sugar in a medium bowl and mix together. Using your fingertips, rub the butter into the mixture using your fingertips. It should end up looking like breadcrumbs. Stir in the milk and you will end up with a very thick batter. 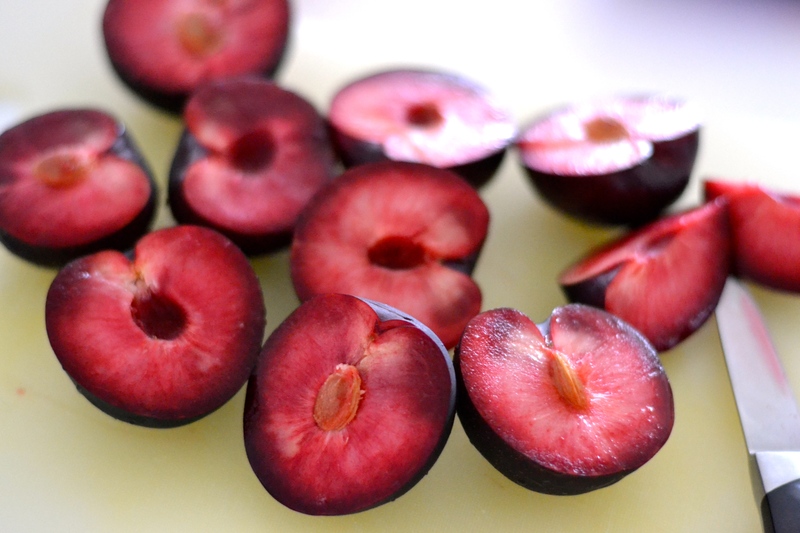 Once the plums have softened, remove from the oven and add about 100ml water to them, gently mixing everything together and scraping any sticky bits from the bottom. 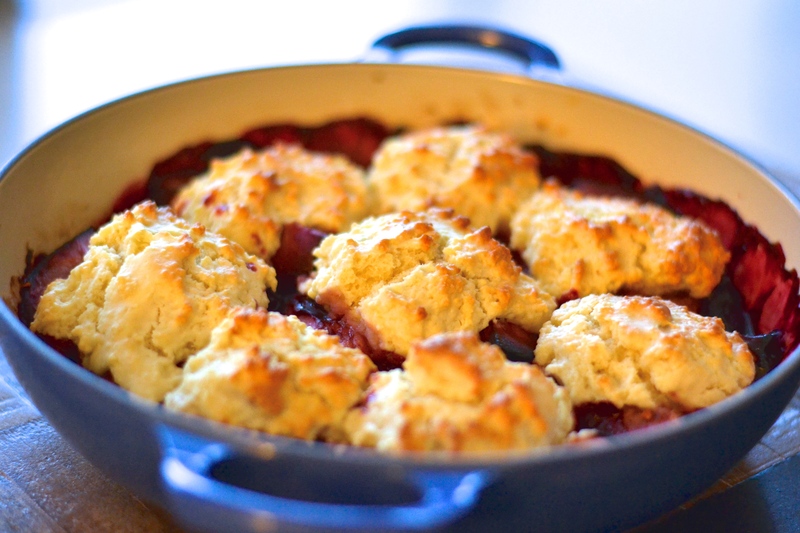 Use a tablespoon to dollop the cobbler mix on top of the plums – don’t worry if it doesn’t cover the whole dish. Return to the oven and bake for 20 minutes, until the cobbler is risen and golden. Serve immediately with some vanilla ice cream if so desired. this recipe looks soo good … and great pictures also ! Thanks Anitacuisine! It’s really tasty – let me know if you give it a try.